What a wonderful festival, thanks to all involved! The UK’s leading genre festival is back with our 15th edition at the BFI Southbank, Stratford Picturehouse and, for the first time, at the very lovely Ritzy in Brixton. Superbob - moved to bigger screen! As ever, we are looking forward to presenting a particularly exciting selection of the best international SF and fantastic films, documentaries and shorts. 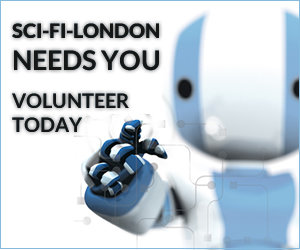 This year we are especially thrilled to have THE VISIT: AN ALIEN ENCOUNTER at SCI-FI-LONDON. we loved Michael Madsen’s last documentary, INTO ETERNITY, and this is equally remarkable. We're also looking forward to seeing SUPERBOB, in the company of an audience, on closing night – a superbly fresh British comedy. As with children, we know that you're not supposed to have favourites, but would like to say that LIZA, THE FOX FAIRY and WHO ARE YOU PEOPLE? are highly recommended. It’s been a really busy year for the festival team as we launched our VOD platform, watchscifi.com, which looks set to become the place to go for your sci-fi movie/documentary/interview fix! We are also delighted to join in the twentieth anniversary celebrations of our longstanding media partner, SFX Magazine!